There can be no denying, that there is much fantasizing associated with the novels of Jane Austen. Some people dream of their very own Mr Darcy, while others don the clothes of Regency England and parade down the streets of Bath in an attempt to journey back in time. Yet, I have always felt that had I been alive in the Georgian period, I would have most likely been one of the servant girls running around after the likes of Miss Jane or Elizabeth Bennet. At last, we don't have to imagine too hard to know what life was like back then for women of the lower classes. Jo Baker has done all the imagining for us and told a story that HAD to be told. 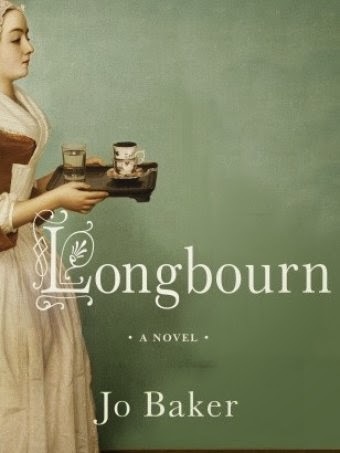 'Longbourn', follows the tale of Sarah, the below stairs servant at the home of the Bennet family, as she undertakes her daily chores and discovers much about herself and those around her. Yet, there is more at work in this very clever novel, as Baker takes the basic plot of 'Pride and Prejudice' and retells it from the point of view of those below stairs, and young Sarah in particular. For example, we see how the house is turned upside down when Mr Bennet announces that Mr Collins is arriving that very day. The servants have been given no prior warning and must pull out all the stops for the man who will one day be their master when he inherits Longbourn. Such are the delights of this novel, as it teaches us so much about the original story and its characters, from a fresh point of view. What I really liked about this book was the way that it forces us to look again at the members of the Bennet household. For example, we see how desperate the situation truly is when Lydia runs away. The servants have to face the scandal in the local post office, forced to mingle with the villagers when Lydia runs away with Wickham. They are not allowed the luxury of hiding away at home, but feel the full force of society's censure during the affair. Yet, the observant reader, can see that Baker actually uses many stylistic aspects of 'Pride and Prejudice' in her novel. Consider the plot line. Like Lizzy and Darcy, Sarah and the handsome young footman, James, argue about books and the importance of reading. It is one of the first things that both couples discuss and discover that they have in common. Also, both female characters anticipate liking their male counterpart, initially, but are sadly disappointed in him. In each case, there then develops a strong feeling of prejudice, whereby the heroine actively takes against the hero, simply because he does not show enough interest in her. Similar too, is the narrative technique Baker uses; allowing us to always know what Sarah is thinking, and then slipping, momentarily, into James's mind - as Austen does with Lizzy and Darcy - so that we learn how he truly feels about Sarah. In this way, the reader, unlike the heroine, is aware that the central male character has fallen in love, and is caught up in the dramatic irony of the piece. Will she ever discover the truth? Will he ever express his feelings? How will they ever be together? The characters are similar too. Darcy and James share a taciturn deposition, both due to social inexperience. This fact is something that each is aware of and it causes them some anxiety. Sarah, too, is quite like Lizzy, being energetic, feisty and prone to judge people by their appearances. Like Austen's character, Sarah misjudges people and makes her fair share of mistakes along the way. Like Lizzy too, she is embarrassed by her 'family' of servants when a footman arrives from Netherfield with a letter for one of the Bennets. She looks around at the sorry lot in the Longbourn kitchen and she suddenly sees them as he must see them, recognising for the first time, how shabby they all are. As with Lizzy, we witness Sarah re-evaluating herself and her home, and not without some pain. In Ptolemy Bingley, the illegitimate son of old Mr Bingley from his sugar plantation, we meet again the idea of inequality of inheritance rights amongst siblings that we found in 'Pride and Prejudice'. As Wickham was almost a brother of Darcy's, so Ptolemy is half-brother to young Charles Bingley. He too has no entitlement to inheritance. As with Wickham, the opportunity to harbour resentment is there, but this time is not allowed to fester. Instead, the novelist chooses to show that even a freed slave, in Georgian England, has the power to go make a living for himself, unlike the ladies who decorate the drawing rooms that they serve in. They cannot even earn a living, but must marry one instead. This novel spans a period longer than 'Pride and Prejudice' itself; from the time before Mr Bennet marries his wife, to after the marriage of Elizabeth and Darcy. And, indeed, while this book mirrors much of Austen's novel, in its dialogue, plot line and style; there is much that is very unlike Austen. For a start, where Austen just mentions in passing, that a private had been flogged, Baker takes that footnote and builds an entire plot around it. The brutality and horror of the Napoleonic Wars plays a large part in the second volume of the novel (Like 'Pride and Prejudice' this novel too is made up of volumes!) As such, this book is like a mixture of the mother text and Bernard Cornwell's 'Sharpe', being every bit as gritty and gory. we see the sense of duty, so similar in the lives of soldiers and servants, and we think of the drudgery that so many people endured. Sarah is very unhappy with her lot at one point, and it is only when she begins to care for another, and she feels loved in return, that she finds some purpose in her life. Indeed, that is not the only way that Sarah differs from Lizzy Bennet. Sarah is in a way a very modern heroine, for she, like Lizzy, says no to a superior member of the de Bourgh family; not Lady Catherine this time, but Mr Darcy himself. She says no to his entreaties to stay in his employ and opts, instead, to seek out the love of her life; to be proactive and make her own destiny. You could say that Lizzy does the very same thing in 'Pride and Prejudice', but what Sarah does seems all the more impressive. She makes her own happiness, risking everything for love; but on this occasion, if she fails, the result will be complete destitution. There would be no soft landing for someone like Sarah. She does not need a Darcy to rescue her, but, it could be argued, ultimately, it is she who does the rescuing. As such, this is a story about a girl, trying to make her way in the world. At a recent public event, P.D. James said that all of Austen's novels are a retelling of Cinderella. Well, from this idea, Jo Baker certainly does not wander far: the main character is, more than once, depicted among the cinders, and one of the first times we see her, is in the morning as she stokes up the fire to set about washing the family's dirty linen. Jane Austen tells us, by all means, to marry for love but to take care and fall in love with a man of good fortune - and we can at last, understand the true merit of this statement. While there is a world of difference between the poverty known by the gentile women of the higher classes -even for the likes of 'Emma's' Miss Bates- and the poverty experienced by those walking the streets or living in the workhouses of Georgian England; it is a fate that no one would wish to succumb to. 'Longbourn' has changed the way we read will Jane Austen from here on in: we can never again look at a beautifully dressed Regency lady without considering the hours of work that made her so. Forevermore, Jane and Elizabeth will be shadowed by Sarah and the girls from below stairs - though they will be out of sight, hiding behind closed doors, or silently watching from atop a carriage- and whenever muslin is worn, we will think of the invisible women who helped scrub and sew, curl and mend, for their stories are important too.